Difference between revisions of "Mount Panorama"
Mount Panorama has recently been met with a rapid drop in temperatures. The spores within its '''Spore Area''' have thus been decaying, with Unimon set on [[Meramon]] within the [[Lava Cave]] being the one to blame. As a result, Unimon sealed the tunnel which leads to the '''Underground Lake''' of [[Drill Tunnel]] in order to contain the threat. A gang of Goburimon has been sighted at the '''Steep Path''', forcing travelers to pay a hefty sum of Bits in order to pass through. Up on '''Miharashi Hill''', a Greymon can be found, who kindly seeks to initiate card trades with travelers. Mount Panorama has recently been met with a rapid drop in temperatures. The spores within its '''Spore Area''' have thus been decaying, with Unimon set on [[Meramon]] within the [[Lava Cave]] being the one to blame. As a result, Unimon sealed the tunnel which leads to the '''Bottom Lake''' of [[Drill Tunnel]] in order to contain the threat. A gang of Goburimon has been sighted at the '''Steep Path''', forcing travelers to pay a hefty sum of Bits in order to pass through. Up on '''Miharashi Hill''', a Greymon can be found, who kindly seeks to initiate card trades with travelers. Mount Panorama has recently been met with a rapid drop in temperatures. 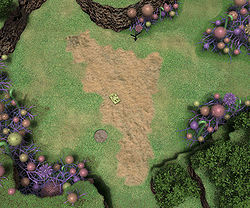 The spores within its Spore Area have thus been decaying, with Unimon set on Meramon within the Lava Cave being the one to blame. As a result, Unimon sealed the tunnel which leads to the Bottom Lake of Drill Tunnel in order to contain the threat. A gang of Goburimon has been sighted at the Steep Path, forcing travelers to pay a hefty sum of Bits in order to pass through. Up on Miharashi Hill, a Greymon can be found, who kindly seeks to initiate card trades with travelers. This page was last modified on 24 December 2016, at 13:33.